Epic and enormous, Capriccio is a masterpiece. Energetic, spirited phrases. Intelligent chord detection works well. Massive library. Sonokinetic's biggest release yet (35GB for the 24-bit version, 18GB for 16-bit - both are included) is the new head of the company's orchestral phrase ROMpler range, which also includes Grosso and Minimal. Essentially, Capriccio is 'Grosso 2': an expansion on the same concept, employing a huge bank of phrases in 4/4 rather than 12/8. The entire orchestra is represented, with separate full and "Lite" NKIs for the various orchestral sections - Strings, Brass, Woodwind and Percussion (tuned and untuned) - plus a Runs instrument and a non-phrased Multisampled Percussion ensemble split into Left and Right hand halves for playability. "It all makes you feel like you're in control of a truly mighty (and perfectly captured) orchestra"
Improving on Grosso's mix of two- and three-layer sections, every section is three layers deep (with four keyswitchable presets), and each layer can be loaded with one of up to 18 phrases (many of them including variations) from the Low, Mid or High (or Piano, Wood or Iron for Pitched Percussion) categories. The supplementary Runs instrument, meanwhile, has two layers each offering a choice of Woodwinds or Strings. The engine itself has been improved in some areas since Grosso, too. You can now audition phrases in the Phrase Picker, MIDI phrases can be dragged out of the GUI, sample release volume can be adjusted independently, and the new Offset slider enables each layer to be displaced by up to one beat in either direction. 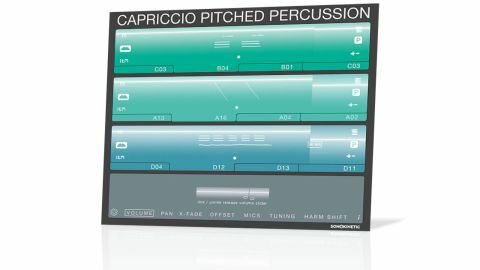 Like Grosso, playing Capriccio involves holding down triads at one end of the keyboard to trigger phrases, while switching presets and applying harmonic shifts at the other. The intelligent chord detection works brilliantly, and it all makes you feel like you're in control of a truly mighty (and perfectly captured) orchestra. The phrases themselves are generally very energetic, spirited and cinematic, and our only real criticism is the same one that we levelled at Grosso: there's no mixer overview page - just separate editors for volume, pan, etc.